HTC Universal is a Windows Mobile 5.0 smartphone and first 3G/UMTS-enabled Pocket PC phone which manufactured by High Tech Computer Corporation, and is marketed and branded by various companies as Qtek 9000, T-Mobile MDA Pro, Orange SPV M5000, O2 Xda Exec, i-mate JASJAR, Dopod 900, Vodafone v1640, Vodafone VPA IV, E-Plus PDA IV, Grundig GR980 and etc. Despite different brand name, model name and housing appearance, all HTC Universal based Pocket PC phone has the same hardware specification. Most models have been SIM locked though. HTC Universal features Intel Bulverde, 180 degrees swivel screen, 3.7″ 64k-color 640×480 VGA transreflective TFT, clamshell body, QWERTY keyboard, built-in 802.11b Wi-Fi, 128 MB ROM, 64MB RAM, touchscreen touchpad, 1.3 megapixel digital camera, built-in Bluetooth, 3G WCDMA/UMTS support, and runs Windows Mobile 5.0 OS. 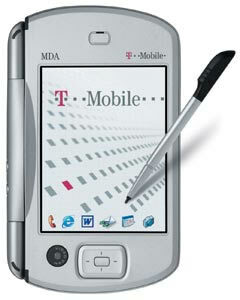 msmobiles (dead link) reviews T-Mobile MDA Pro (HTC Universal) and concludes that HTC Universal has the advantages of been the only Windows Mobile phone on the market with VGA display (640×480), UMTS/3G/W-CDMA, 3G video calling, very big and very comfortable QWERTY keyboard, free SIM unlock available, very flexible hardware design so that users can use it as PDA phone with touch screen or as mini notebook and availability of Push Email and A2DP (stereo audio over Bluetooth). However the disadvantages are too big for most people to be used as regular mobile phone, lack of support for cellular standards: EDGE, HSDPA, American UMTS, GSM850 (one of 2 American GSM bands) and may be expensive.